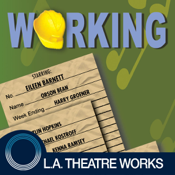 Working (by Studs Terkel) is presented by L.A. Theatre Works. This standalone audiobook app combines a professional audio recording with supplemental features for download-once, grab-and-go anywhere enjoyment. The first revised and updated version of this 1970’s cult classic. A rousing musical with a cast of twenty, Working is for anyone who has ever punched a clock, a cow or a supervisor—or wanted to. An L.A. Theatre Works full-cast performance featuring Eileen Barnett, Orson Bean, Harry Groener, Kaitlin Hopkins, Michael Kostroff, Kenna Ramsey, Vickilyn Reynolds, Vincent Tumeo and B.J. Ward.